Born a free man in Burlington County, New Jersey, William Still became a member of the Pennsylvania Anti-Slavery Society and director of the General Vigilance Committee of Philadelphia. He managed the committee's finances, which were used to assist Harriet Tubman's rescue efforts. Still also established a network of safe houses and contacts stretching from the upper South to Canada. 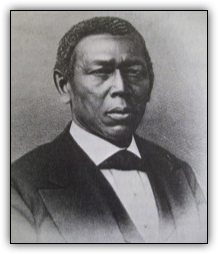 Still also wrote William Still's Underground Railroad, an abolitionist account of the freedom network, in which he championed the hundreds of brave fugitives he interviewed as they made their way to the North. In one interview, the author made the dramatic discovery that the fugitive confronting him was his own brother, a man from whom he had been separated since boyhood. Although Still had intended to use his interview material to assist other escaped slaves find their loved ones, he decided to compile the detailed information he had gathered into a book. This successful businessman first published William Still's Underground Railroad in 1873, making sure that the work would have a wide circulation by hiring agents to sell it in major cities. "Doctor" James Still was the son of Levin Still (formerly Levin Steel) and Charity Still (changed name from Sidney to Charity) and older brother of abolitionist, William Still. James Still was a self-taught physician in the Medford, New Jersey area, who was widely known as the "Black Doctor of the Pines.” A practitioner of folk remedies, Still learned about the healing powers of herbs and plants. He apprenticed himself to a white doctor and later became known as Doctor James Still. In 1877, he published "Early Recollections and Life of Dr. James Still, in which he wrote, "In very early life my mind was troubled about what should be my occupation in life, although I had almost daily presentiments from three and a half years of age until I was twenty two or three, that I should be a doctor...I supposed I would need to go to college...but I had no finance...and worst of all, I was not the right color to enter where such knowledge was dispensed." (p.7) Nevertheless, his own son, James Thomas Still, graduated with honors from Harvard's School of Medicine in 1871. Still, James. Early Recollections and Life of Dr. James Still, 1812-1885. Medford, N.J. Medford Historical Society, 1971. Where many thousands have gone. Where night is changed to day. Or clouds to pass away. No sorrow there may come. In that heavenly, happy home. While conquering palms they bear. The theme of harp and song. Till they God's fullness know. Born in Medford, New Jersey, Dr. James Thomas Still was the first child of Dr. James Still and Henrietta Still. He was the nephew of William Still, the abolitionist. His father,James Still, despite having no formal medical training, was a renowned herbalist in Medford Township, New Jersey, who gained a wide reputation for prescribing successful remedies to his patients. James Thomas Still attended school in Mount Holly, New Jersey, before entering Harvard Medical School in 1867. Having presented his thesis on hay asthma and hay fever, Dr. Still graduated with honors in 1871. Remaining in Boston after graduation, he began his medical practice at 166 Cambridge Street, where he treated sick people in the black community until his death at age 55 of Bright's Disease. In 1899, Dr. Still's pamphlet, "Don't Tell White Folks, or Light out of Darkness," was published. Nercessian, Nora N. “Nineteenth-Century Black Graduates of Harvard Medical School. The Journal of Blacks in Higher Education 47 (2005): 88-92. Ethnic NewsWatch (ENW), Proquest. Web, 30 Apr.2012. Still, James Thomas. “Don’t Tell White Folks”: or Light out of Darkness. Boston: J. Still, 1889. Click the link for an article from New Jersey Monthly, detailing a short family history of the Still family.